Mass-producing challenging exercises for online education platforms such as Khan Academy is time-consuming and expensive. 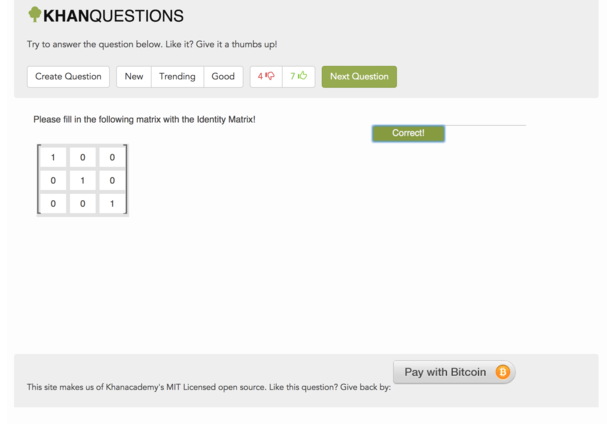 We decided to implement Khan Academy's question editor/render on a crowdsourced website, where you can upvote/downvote submissions and provide BitCoin incentives for a category if you find it lacking (to be distributed to the highest ranking submission in that category after a week). The editor (https://github.com/Khan/perseus) is the same that is currently used for all math questions on khanacademy.org. Comments for this submission are closed. View the software in eyvindn's portfolio to continue the conversation.